Scientists have known for a while that the building blocks of Earth life, amino acids, are also found in space. Traces of amino acids have been studied in countless meteorites. But now Arizona State researcher Sandra Pizzarello says Earth amino acids also share the same basic structure with those from distant space. This discovery, announced yesterday in Proceedings of the National Academy of Sciences, could mean that extraterrestrial life would share other structural similarities with Earth life — like symmetrical bodies, for instance — especially if that life had developed from amino acids the way we did. Scientists have long known that most compounds in living things exist in mirror-image forms. The two forms are like hands; one is a mirror reflection of the other. They are different, cannot be superimposed, yet identical in their parts. When scientists synthesize these molecules in the laboratory, half of a sample turns out to be "left-handed" and the other half "right-handed." But amino acids, which are the building blocks of terrestrial proteins, are all "left-handed," while the sugars of DNA and RNA are "right-handed." The mystery as to why this is the case, "parallels in many of its queries those that surround the origin of life," said Pizzarello. Years ago Pizzarello and ASU professor emeritus John Cronin analyzed amino acids from the Murchison meteorite (which landed in Australia in 1969) that were unknown on Earth, hence solving the problem of any contamination. 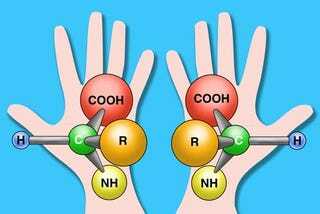 They discovered a preponderance of "left-handed" amino acids over their "right-handed" form. "The findings of Cronin and Pizzarello are probably the first demonstration that there may be natural processes in the cosmos that generate a preferred amino acid handedness," Jeffrey Bada of the Scripps Institution of Oceanography, La Jolla, Calif., said at the time. The new PNAS work was made possible by the finding in Antarctica of an exceptionally pristine meteorite. Antarctic ices are good "curators" of meteorites. After a meteorite falls — and meteorites have been falling throughout the history of Earth — it is quickly covered by snow and buried in the ice. Because these ices are in constant motion, when they come to a mountain, they will flow over the hill and bring meteorites to the surface. "Thanks to the pristine nature of this meteorite, we were able to demonstrate that other extraterrestrial amino acids carry the left-handed excesses in meteorites and, above all, that these excesses appear to signify that their precursor molecules, the aldehydes, also carried such excesses," Pizzarello said. "In other words, a molecular trait that defines life seems to have broader distribution as well as a long cosmic lineage." So the humanoid-looking Star Trek aliens may not be quite so ridiculous after all. Perhaps all amino-acid based life will share the left- and right-handed structure with us. I for one welcome our symmetrical cohorts from this local volume of space.